While marketing automation systems remain a key part of the Demand Factory™ infrastructure, the last several years culminated in 2014’s official launch of the Marketing Cloud – a treasure trove of marketing tools and systems that will enable us to expand our high-tech, high-touch, and highly automated demand generation factory. Modernizing marketing with the Marketing Cloud is akin to how the industrial age modernized manufacturing, and the information age further accelerated production with robots and sophisticated systems. With what I call “Generation D” (the D is for digital), shoppers and buyers are primarily using digital experiences to research, order, and receive products. The buyer’s “digital body language” and “fingerprints” are everywhere — and that has led to new tools for analyzing predictive patterns, serving up highly targeted ads and content, and (literally) thousands of other marketing applications that will both empower and overwhelm us. When my book Manufacturing Demand hit the shelves just two years ago, I focused on the three essential systems for modern marketing: marketing automation, CRM, and the website. Just two years later, there are at least 2,000 firms in the space – 1,000 started last year alone, according to Scott Brinker @chiefmartech who’s keeping track for all of us. 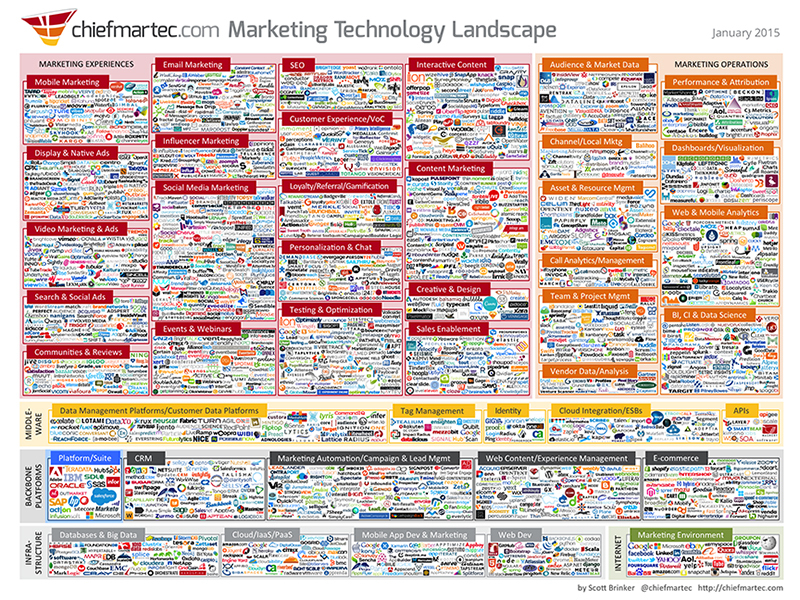 This is Scott’s picture of the marketing landscape as it stands today. Is all this just for BIG companies? Absolutely not. Our own marketing team at DemandGen uses 30 distinct systems for running our Demand Factory™. Sure, we’re on the cutting edge and are early adopters since we need to practice what we preach. Nonetheless, that’s a lot of horsepower to budget for, utilize, integrate, and apply resources to. All this innovation and new technology is exciting, no doubt. However, before you go on a shopping spree, I have some helpful advice. For those of you already working with DemandGen, rest assured: We are here to help identify which platforms in the Marketing Cloud are worth a look and help you with the rollout, integration, and optimization. We also can connect you with our early adopter clients who can tell you about their experiences using the various systems. Increase your marketing systems budget this year and each year afterward. You’re going to want more technology sooner than you think, so budget for it. Most marketing technologies are at least $2,000/month, so budgeting $100K+ (after your marketing automation system) will enable you to add two to four new platforms to your Demand Factory. Don’t get caught in the “shiny new toy” mindset. Planning and processes should happen before a purchase decision. If you’ve not fully leveraged your marketing automation system, that might still be your top priority before you take on more tools and toys. Seek advice from firms like DemandGen on how to adopt, leverage, and integrate these systems with your marketing automation and CRM system. Your Demand Factory should be one integrated marketing infrastructure and not a whole bunch of separate systems. Make 1+1=3. Before you buy, talk to peers about the marketing technology you’re considering. Besides the demos you get from vendors, ask for references (and call them). Not only will you learn how satisfied they are, you’ll also discover what it took to get results. While marketing automation remains the core engine of the Demand Factory, be sure you’re catching up on the new tools that take your marketing infrastructure to the next level of output and performance. Just do so thoughtfully and with the right support. Next Up: Have you hit the ceiling? Overworked and under-resourced? There’s a cure (that doesn’t involve quitting your job): a new operating mindset called “Marketing-as-a-Service.” It just might be the model you need to scale (and to sleep better at night). Great work. Sending you an invite to connect on LinkedIn. Looking forward to reading your book.